The Alaska Public Offices Commission is coordinating with the U.S. Justice Department to probe what Veco Corp. illegally did to benefit Alaska politicians. 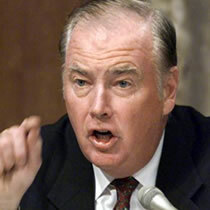 Corrupt ex-governor Frank Murkowski (pictured) took an illegal $20,000 poll/bribe from Veco. JUNEAU, Alaska -- The Alaska Public Offices Commission is coordinating with the U.S. Justice Department to probe what Veco Corp. illegally did to benefit Alaska politicians. The commission, which investigates campaign-finance violations, is focusing on matters such as polls the oil-services company may have illegally bought for legislators, as well as illegal Veco campaign contributions, The Anchorage Daily News reported. The Justice Department, the FBI and the Internal Revenue Service are conducting a widespread investigation into alleged political corruption of lawmakers in the Alaska Legislature, focusing in particular on lawmakers' official actions in connection with the oil industry, fisheries and private corrections industry. Former Alaska lawmaker Pete Kott, accused of trading his legislative influence for bribes, was convicted of corruption charges in the scandal Sept. 27. Veco founder and Chief Executive Officer Bill Allen and Vice President for Community and Government Affairs Rick Smith pleaded guilty May 7 to charges of bribery and conspiracy. Because of the chances of overlap between the state and federal probes, the state commission is cooperating closely with the Justice Department, particularly on the issue of subpoenas, the newspaper said.